The ouija, also known as a spirit board or talking board, is a flat board marked with the letters of the alphabet, the numbers 0-9, the words "yes", "no", "hello" (occasionally), and "goodbye", along with various symbols and graphics. The primary purpose of the Ouija Board is to talk to spirits for answers to mysteries and directions. This Solar Astrology Ouija Spirit Skull Statue is 6" tall 8.5" Long and 5.5" Wide approximately. 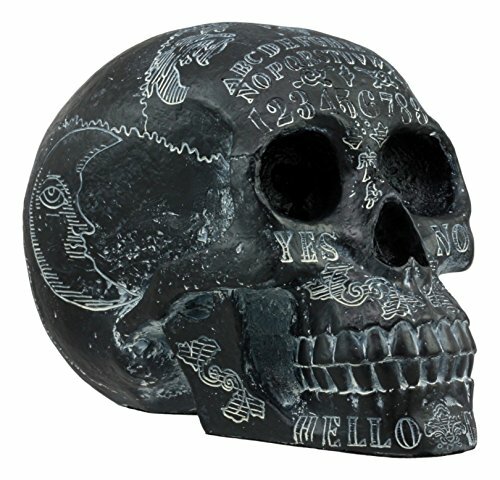 This Solar Astrology Ouija Spirit Skull Statue is made of composite resin hand painted and polished individually. This Astrology Ouija Skull figurine is not made by actual paranormals and has no spiritual powers. It is being sold as a decorative skull.